Due to restrictions on their license Sipsmith has to commission a base spirit that they then distil. The spirit is distilled once to produce their vodka, and then some of the product is then re-distilled too make their gin, before cleaning the still and starting again. The spirit is poured into the belly of Prudence (their beautiful copper still), which acts much like a kettle. She holds 300 litres of liquid, which produces no more than 250 bottles of each spirit in each distillation run (when these guys say small batch they aren’t joking!). As the liquid is heated vapours begin to rise up through a pipe known as a swan’s neck (as Prudence is a tight fit the neck grazes the ceiling!). It is a beautifully shaped piece of kit, so much so that Sipsmith use the shape in their motif. Away from the heat of the belly of the still the vapours begin to condense and fall down another pipe into a cooling chamber where they become liquid again. The copper wall of this chamber absorbs the liquid’s soft fatty acids, a process which Sam attributes to giving the spirit it’s character. After being held for a short time to ensure as many of the fatty acids are absorbed as possible, the liquid is heated to evaporate once more, before passing through a condenser and becoming liquid again. It then sits in the spirit safe (a fairly traditional feature in distilling) where it is ‘cut’. This involves removing the initial product (the head) and the end of the product (the tail) which are of poor quality. The distillate from the middle of the process is retained (the heart) and is pure enough that it doesn’t need filtered. 40% of the heart is kept, diluted and bottled – their vodka – and the remaining 60% goes on to make the gin. Usually the heads and the tails are recycled and fed back into the belly of the still for re-distillation, however Sipsmith believe that this would compromise the quality of their spirit and discard them (Sam told us there are plans afoot to use this waste as fuel for a company car: a vod-car – genius!). Macedonian juniper, Bulgarian coriander, French angelica root, Spanish liquorice root, Italian orris root, Spanish ground almond, Chinese cassia bark, Madagascan cinnamon, Sevillian orange peel and Spanish lemon peel. 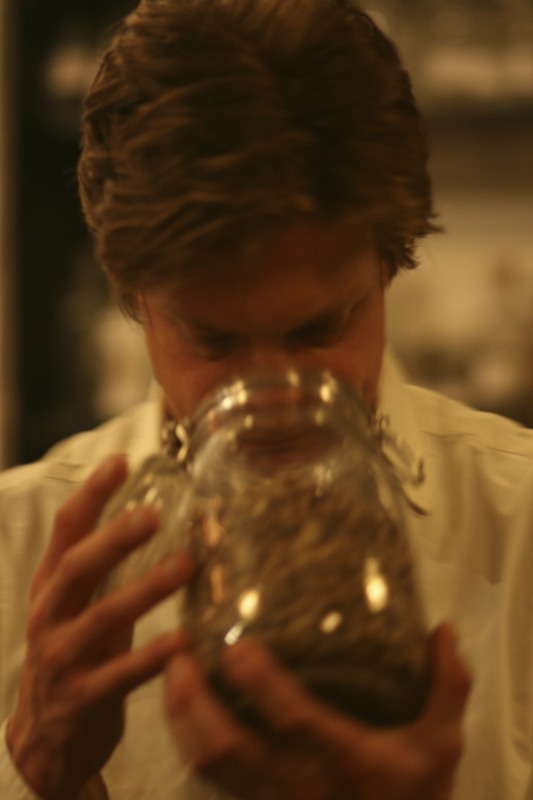 Sipsmith is the only producer in Europe who use the ‘one shot’ gin method which involves distilling the botanicals with the spirit rather than making a concentrate which is blended with the neutral spirit. This is a more expensive way to produce the spirit, however Sam and his team believe it produces a better final product. 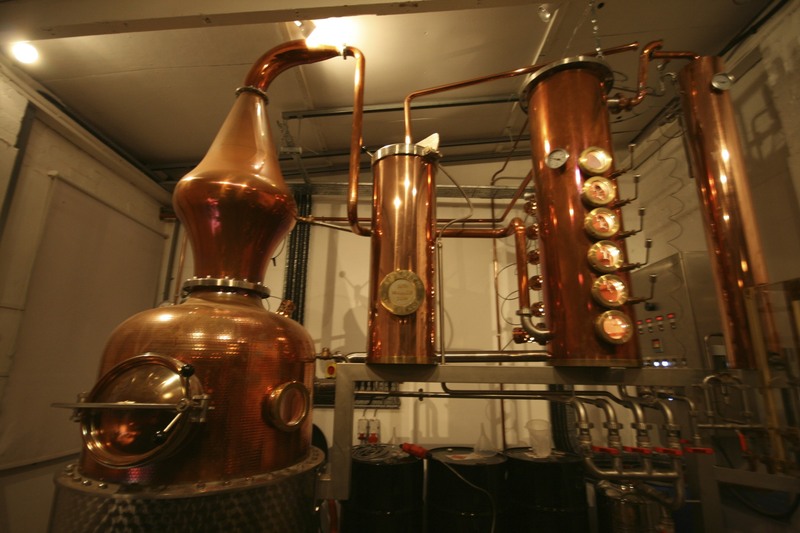 Prudence needs to be altered before she is ready for gin distillation though, as if the spirit were to enter the final condenser the taste from the botanicals would be affected. The botanicals are then left overnight in her belly at 75 degrees so they can release their flavour, before once again making their (shorter) journey though the still. Once in the spirit safe again the liquid is cut to remove the heads and the tails, and the remaining heart is blended with Lydwell Spring mineral water (the source of The Thames) and bottled.